Durango Silver Company specializes in Mens Silver Jewelry! 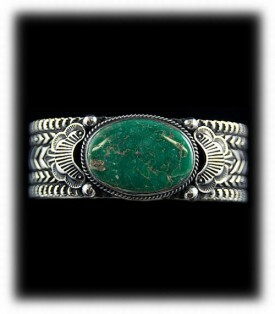 We produce mens Silver Jewelry in a Southwestern style that is unique to our company. We use a lot of high quality Turquoise in our men's Silver Jewelry as we have been in the Turquoise Jewelry business for nearly forty years. We have one of the largest highgrade Turquoise collections in the world and mine Turquoise in Nevada as well and due to this fact, Mens Silver Turquoise Jewelry is another specialty of our company. 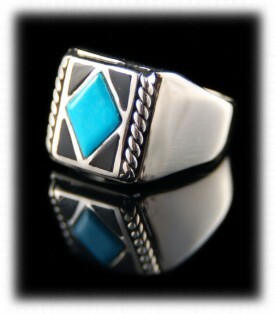 Durango Silver Company produces many types of mens Silver Jewelry. Mens Silver Rings, Mens Silver Bracelets, Mens Silver Belt Buckles and many other types of Mens Silver Jewelry. Below are some examples of mens Silver Jewelry that have been made or produced by our company. We do produce a wide variety of Mens Silver and Turquoise Jewelry and are known for producing some of the finest Southwestern Mens Silver Jewelry coming out of Southwestern United States today. To the left is a very handsome piece of Mens Silver Jewelry produce exclusively by Durango Silver Company. This particular Sterling Silver Mens Ring features a fantastic Turquoise Gemstone from the Bisbee Turquoise Mine located in Bisbee Arizona. 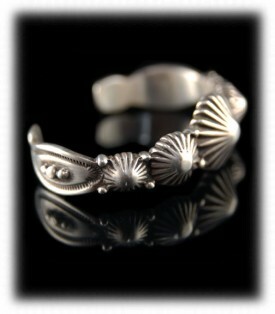 This is a classic Mens Silver Ring design that was made by John Hartman, one of Johns specialties are mens Silver Rings. We have many different men's Silver Ring styles of this type which we call a saddle ring due to the completely round shape of the ring with the design built to fit the circular ring. 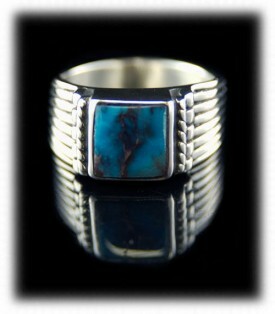 This is a classic example of Mens Silver Turquoise Jewelrymade by Durango Silver Company. 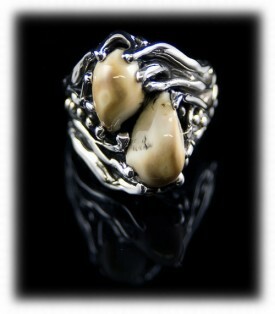 To the right is a piece of Mens Silver Jewelry with the use of authentic Elk Teeth incorporated in the design. The Silverwork in this Silver Ring is called "Lost Wax Design" and this is created by applying layer over layer of molten Jewelers wax with special Jewelers tools to create a one of a kind unique piece of Mens Silver Jewelry. Men who enjoy hunting or outdoor lifestyles tend to enjoy having a piece of men's Silver Jewelry with a wildlife flair such as this men's Elk Tooth Silver Ring as well as the Kodiak Bear Claw Silver Necklace above. We are always open to new ideas in Men's Silver Jewelry with wildlife design or accents and we have created some very unique men's Silver Jewelry throughout the years for our clientele. To the left is a handcrafted Navajo Mens Silver Bracelet featuring a Broken Arrow green Turquoise Gemstone from Nevada, USA. This piece of men's Silver Jewelry is a one of a kind produced by Durango Silver Company, Dillon Hartman cut the Broken Arrow Cabochon and than the piece of Mens Silver Jewelry was created by a Navajo artisan. You can read more about the artist and this Silver Mens Bracelet on its presentation page. Navajo Silverwork is known for having stampwork as seen in this example and also most often is accompanied by a Turquoise stone. Navajo made mens Silver Jewelry is also made in plain Silver with no stones and many men prefer nicely stamped Silver Jewelry such as the Men's Silver Bracelet to the right. 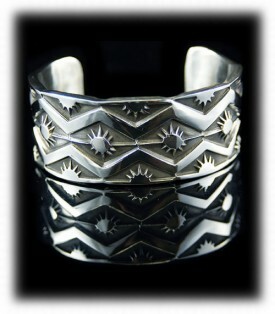 To the right is a piece of Navajo handmade mens Silver Jewelry made in Sterling Silver with no stones. Although many Navajo Silversmiths prefer to use Turquoise or other gemstones in their men's Silver Jewelry items, there are also many Navajo Silversmiths that make mens Silver Jewelry with no stones. Durango Silver Company produces plain mens Silver Jewelry as well as plain mens Silver Jewelry by other Silversmiths from the Southwestern USA. The above photo displays a Mens Silver Bracelet that has deeply stamped designs in a substantially heavy Silver bracelet frame. There are many styles of Navajo Stamped Silver Bracelets as well as many other types of Navajo stamped mens Silver Jewelry, Durango Silver Company tries to always have several unique pieces of hand stamped mens Silver Jewelry available. To the left is another piece of "Lost Wax" Mens Silver Jewelry handmade by Crystal Hartman of Durango, Colorado USA. This mens silver ring was made by using a hot Jewelers wax pen to lay multiple layers of wax to build up a design for this particular Broken Arrow Turquoise Stone. This means this is truly a one of a kind piece of Jewelry art made for one person. It is very rare these day to own a one of a kind piece of anything! and it was made right here in the USA. 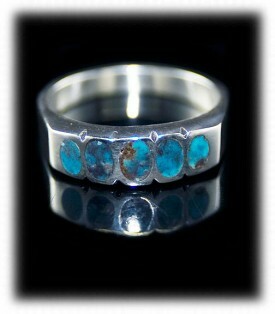 This is what you get when you buy Mens Turquoise Jewelry from Durango Silver Company. 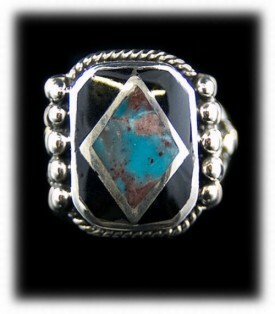 To the right is a unique Mens Silver Inlaid Ring inlaid with spectacular Bisbee Turquoise. The Bisbee Turquoise Mine produced Turquoise from about 1950-1976. the mine has been close since and Bisbee Turquoise has become very scarce. 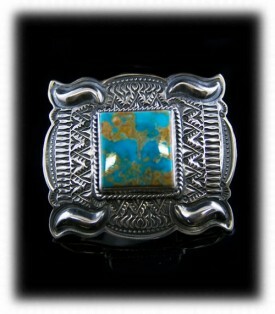 This particular Silver Ring was inlaid with five unique Bisbee Turquoise Stones and is a piece of mens silver jewelry that you will not find in the open marketplace. 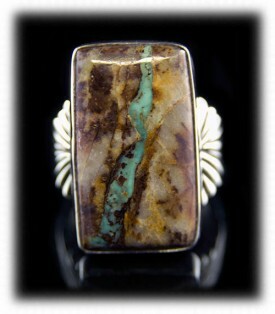 To the left is a Mens Silver Ring that is inlaid with Bisbee Turquoise and Jet. This Bisbee Turquoise Mens Ring is a beautiful piece of Southwestern Mens Silver Jewelry that is unique and not seen available from anyone else then Durango Silver Company. You can read more about this piece on its presentation page by following the link above. To the right is a Mens Silver Ring made by John Hartman of Durango Silver Company. 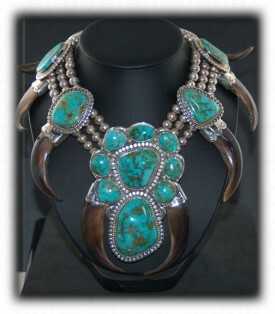 It features a beautiful ribbon Turquoise Stone from the Royston Turquoise Mine located near Tonopah, Nevada. Quality Southwestern Silver Jewelry of this quality and uniqueness is not readily available by many companies as it is a one of a kind piece of Silver Jewelry handcrafted with natural and quality materials right here in the USA. Read more about this Mens Silver Ring on its presentation page. To the left is a Mens Silver Ring with White Buffalo Turquoise inlaid by Dillon Hartman of Durango Silver Company - Made in the USA! 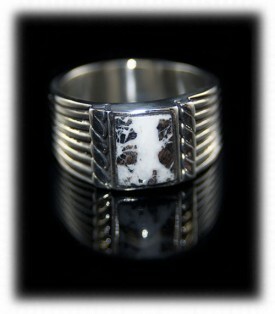 This is a classic Mens White Buffalo Silver Ring that will last a lifetime. Sterling Silver Jewelry made by Durango Silver Company is made in the USA and is of substantial weight Silver and the highest quality of craftsmanship. You are certain to be more that satisfied with the quality of our Silver Jewelry - guaranteed! 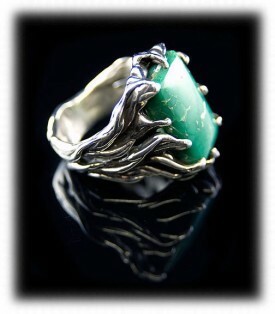 To the upper right is a classic Mens Silver Ring that is inlaid with beautiful Sleeping Beauty Turquoise and Jet. This is a classic Southwestern Silver Mens Ring that will stand the test of time for its design and quality of craftsmanship. To the left is a very unique Mens Silver Bracelet that is certain to please the most discriminating Silver Jewelry connoisseur. This piece of Mens Silver Jewelry was produced by Durango Silver Company and is truly a one of a kind piece of Mens Silver Jewelry. This is a quality Mens Silver Bracelet that is comfortable when worn and a gentleman will enjoy wearing this unique piece often. 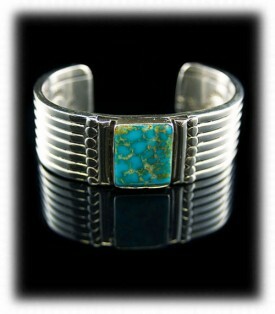 You can read more about this Turquoise Mountain Silver Bracelet on its presentation page. 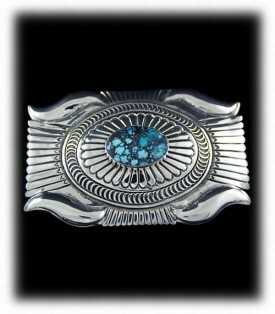 To the right is a fabulous piece of Mens Silver Jewelry made here in the Southwest. It is inlaid with exciting and gorgeous Carico Lake Turquoise from Nevada. This is a one of a kind piece of mens Silver Jewelry that is rarely seen for sale. Special Mens Silver Jewelry is our specialty here at Durango Silver Company. We invite you to check out our mens Silver Jewelry and also to visit often as our stock changes frequently. To the left is a Navajo handcrafted Silver Thunderbird Pin made for a gentleman's hat or as an accessory to his jacket or other attire. 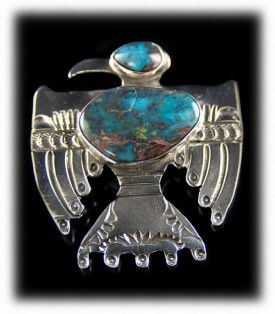 This Silver Pin was handmade with Bisbee Turquoise which is rare and seldom scene on the open market. It is a unique piece for an interesting gentleman that likes character in his daily presence as he goes out on the night or even in his general daily life. Quality Silver Jewelry worn by a man individualizes himself from the crowd and people really do pick that up! 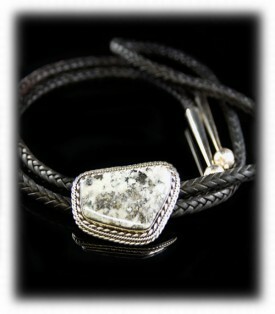 To the right is a quality handmade Silver Bolo Tie made by John Hartman of Durango Silver Company. This beautiful piece of Sterling Silver Jewelry has a White Turquoise Stone that is astonishingly attractive accompanied by exceptional Silverwork by John. Quality mens Silver Jewelry has now become a great investment as Silver is slated to reach $135.00 per ounce by the end of 2012, it has doubled in the past year already. We believe high quality mens Silver Jewelry is the way to go as it does not cost much more that you typical mass produced production Silver Jewelry found in department stores. 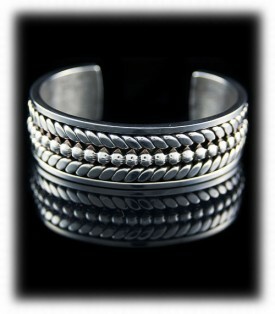 Check out our Mens Silver Jewelry and you will be pleasantly surprised! To the left is a classy Sterling Silver Belt Buckle. This piece was completely handmade here in the Southwest in Sterling Silver with a Turquoise Stone from the Kingman Turquoise Mine located in Arizona. This is one or the first Turquoise Mines discovered by the Native American Indians over 2000 years ago. Its authentic design in Silver is special and quality mens Silver Jewelry such as this piece from Durango Silver Company are true pieces of art in the form of Silver Jewelry. To the right is also a Navajo Indian handmade Sterling Silver belt buckle made for a high class gentleman that appreciates high quality Silver Jewelry. This is a large Silver Belt Buckle and a great piece of mens Silver Jewelry. It features fantastic Silver word which is accented by a beautiful Turquoise gemstone that will enchant anyone that has good taste in mens Silver Jewelry. Durango Silver Company always has a good stock of Silver belt buckles as well as many other types of mens Silver Jewelry, come and take a look. To the left is an antique Southwestern style Silver Mens Bracelet that was made by John Hartman. This Mens Silver Bracelet design was originally made for the Fred Harvey Company by John in the 1970's to sell in their Trading Post at the Grand Canyon. Many of these bracelets were made for and sold by the Fred Harvey Company in that period. John has brought back this design in 2011 and is currently making a few more for his special clients. You can find this Silver Mens Bracelet on the Durango Silver Company Online store. To the right is a handsome piece of Mens Silver Jewelry. This Mens Silver Bracelet was produced by Durango Silver Company and is made with three different types of Silver wire to created this very attractive mens Silver Bracelet. You can often find mens bracelets on our site and we hope you will come back often to see what we have added since you were here last. Durango Silver Company makes and produces some of the highest quality Mens Silver Jewelry coming out of the Southwest and we hope you agree! Most of our Silver Jewelry is handcrafted in Durango, Colorado USA - if not, it is contracted to other Southwestern Silver Artisans in the Southwest region of the United States. We hope you have enjoyed our presentation on Mens Silver Jewelry. We have many great presentation pages on different subjects related to Silver Jewelry in our Southwestern Silver Jewelry Learning Center for you to choose from if you are interested. If you enjoyed this presentation, take a look at our Silver Jewelry Videos page as well as our Silver Jewelry page. Also if you like the quality products and information that we offer, we invite you to join our Newsletter Group where we have a monthly Silver Jewelry Giveaway and special deals from our members only. We hope you have gained some useful knowledge from our Mens Silver Jewelry educational presentation page. We invite you to learn more about Silver Jewelry, Indian Jewelry and Turquoise Jewelry by following the links in our Learning Center which has many other informational pages that we have written on topics related to Southwestern Silver Jewelry. In addition, we would like to invite you to join our E-Mail Newsletter - about once every other month we send out a Newsletter to inform our members of what's happening with Durango Silver Company, new products, specials for our members and more. We also have a monthly drawing from our members to Giveaway free Turquoise Jewelry from our company. Please take a moment to become one of our friends and future winners in our giveaway by signing in below. Thank you for reading our information about Mens Silver jewelry we hope this information will be helpful to you in your next purchase of Men's Silver Jewelry.